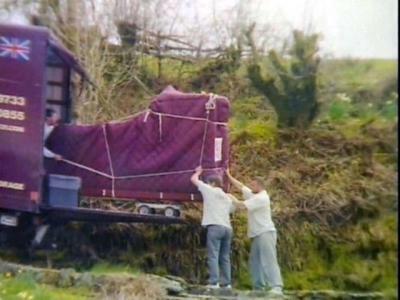 “Hold on kiddies, this is going to be a bumpy ride!” Movers dropped an $88,000 concert grand piano from a truck in England, and the whole thing was caught on camera. Here are pictures of the unfortunate event. I’m sure glad I wasn’t the one that dropped Bosendorfer on the ground, but at least I can giggle a little at the photos here. Moving a piano is all about leverage and balance. I’ve seen a single expert dismantle and move a baby grand piano by themselves. 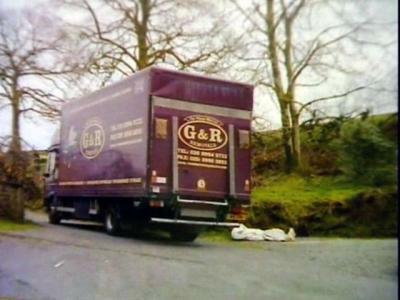 I remember many moons ago having to deliver pianos when I worked sales in a piano showroom. It sure isn’t easy if you don’t have it down to a perfected system. My favorite picture is the fourth one where the guy has his hands over his head as the shock of what just happened hits him. 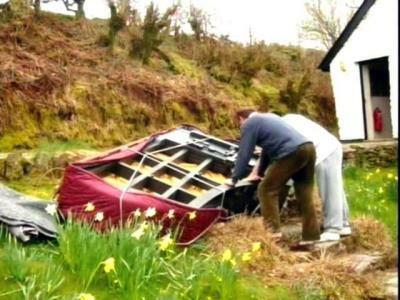 The half-ton instrument was dropped as it was being brought into the home of the organizers of an annual music festival in Devon, England. The famed Bosendorfers piano was purchased at an auction for 45,000 British pounds, or just over $88,000. A couple had spent two years raising the money for the piano, which was to be the highlight of this year’s music festival. It was insured for $50,000. It was sent to London, where experts were assessing the damage. 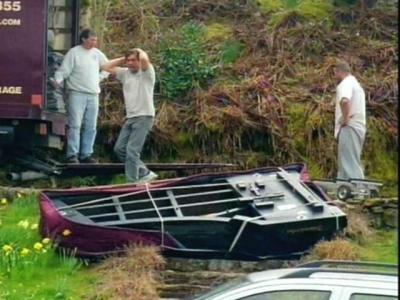 The owner of the piano, who never got to play a note, said it’s unlikely it will ever be the same. 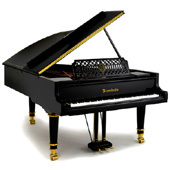 The Bosendorfer is considered to be the Stradivarius of the piano world. 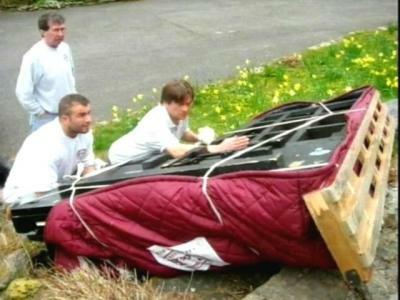 In this last photo it looks like the piano movers who dropped the piano got confused and are trying to plant the Bosendorfer in the ground. Which begs the question: What kind of fertilizer would you use to grow a piano? This is by far the saddest story on the internet, even above that one about the puppy. National Opera here, in Latvia, dropped Bosendorfer too few years ago, but from 2th floor! This brings back a horrible memory – Dad had spent weeks – months – refinishing the oak wood on the piano we’d been able to buy. He did the refinishing in the garage and the result was beautiful. The day came when it was ready to be brought back to the living room — a hot day. He put the piano on a “dolly” and together we wheeled it along the asphalt walkway to our front door. He told me to hold the piano upright on the dolly while he put down a board to wheel it up the step to the doorway. What we both neglected to consider was how soft the asphalt was from the heat, and the weight of a piano — the dolly began tilting as the asphalt gave way to the weight — and before either of us could do anything, the newly finished piano went over with a bang – flat on the back in the middle of the yard. I expected to turn and see a million pieces…but we picked it up – got it into the house, and we’re still playing it. Of course, you have played it and know it is not good enough for someone of your caliber – but it works for me. However, when we moved it here, we hired a truckload of huge musclemen to do the job. Dad doesn’t ask me to help him move things any more. Thanks for sharing, glad I stumbled across your site and it shows that not all movers are experienced with very valuable pianos!